Network and Networking. It is all about creating connections. When I was asked this summer about the difference between networking and a network I responded spontaneously with this drawing. Networks need networking. Networking result in networks. Having a look at the drawing now, I must say that the relation is not that linear and simple. 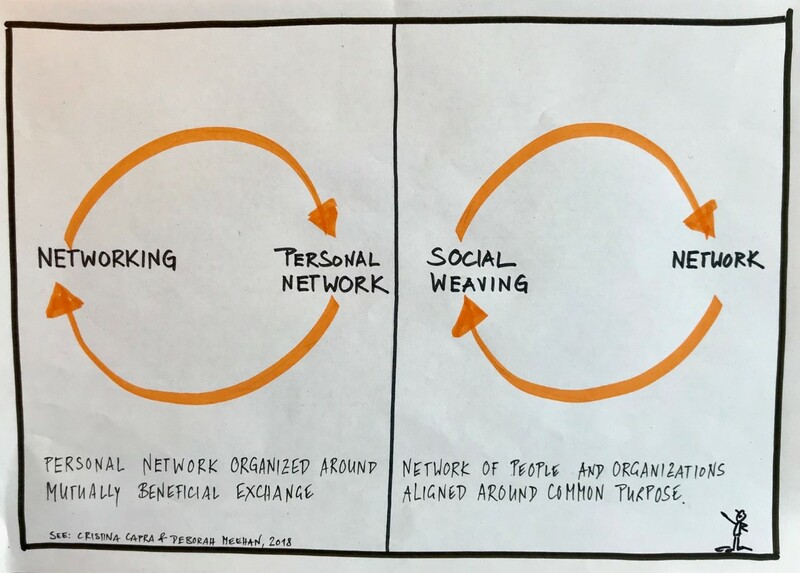 It depends as so often on the context and our intent of why we are networking and for which kind of network we are creating connections. Today I would respond in a more differentiated manner. Networking results in networks. But the result is not always the same. Networking results in different types of networks: one that is in support of a sole person or a network of people and organizations driven and aligned by a shared purpose. 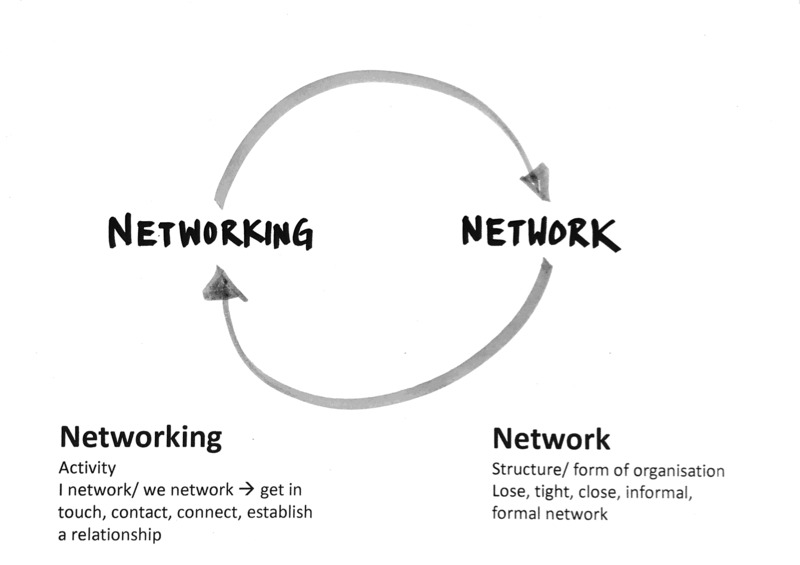 When we network, we know which kind of network we want to create, networking is a strategic task. Networks need networking. Always. But different types of networks need different types of networking. The basic structure of networks are nodes and links; people or organizations and the connections between them. These connections need to be built, renewed and maintained. The kind of network we want to create has an impact on the quality of the networking and the connections we want to build. If someone is networking for her/ his personal network, connecting to others and finding mutual benefit is fine. It is a different case for a network aligned by a shared purpose (e.g. a knowledge or learning network or a thematic network reaching across organizational boundaries). In this case more than personal connections need to established. The network weaver creates multiple connections in all directions and encourages others to do so too. I’m more at ease with this differentiation though I must admit it is still over-simplified. To do justice to networks we have to acknowledge that networks take many shapes, colors and flavors. See the excellent introduction by Cristina Capra about ego-centric and eco-centric networks, socio networks with clear boundaries and open social networks. In the next blog post I will share some reflections on how networks can be strengthened through social weaving.